Bishop Samuel Roy Johnson, Sr., Pastor & Founder of Living Water World Ministries is happily married to Elder Wanda Lee Johnson. This November they will celebrate their 40th wedding anniversary. To this union are two sons, Samuel Roy Johnson, Jr. and Jason Duane Johnson. They are natives of Middletown, Ohio. Bishop Johnson attended Miami University. He received a Bachelor of Arts Degree in Theology at the Pacific Bible Institute. In June 2009, Bishop Johnson received his Master’s in Sacred Music and Doctorate in Theology from North Carolina College of Theology. As a result of his educational accomplishments, Bishop Johnson opened Dayton Metropolitan College of Theology in August, 2009. Bishop Johnson was licensed to minister the Gospel in April of 1986 and ordained November, 1986. In the spring of 1996, God gave a vision to Evangelist Samuel Roy Johnson, Sr., the vision to assembly some of God’s children for praise and worship became a reality. On January 19, 1997 the birth of Living Water came to order at his home. Sister Wanda L. Johnson supported her husband in the vision. The church moved from his home and opened its doors at Blair wood Elementary School, 1241 Blair wood Avenue, Dayton Ohio and on July 12, 1998, moved to the YMCA on Dayton Liberty Road, . On December 31, 1998, Living Water moved to 1422 N. Main Street, Dayton, Ohio. God’s abundant blessings have been manifested in such a way that Living Water World Ministries as acquired 81 acres of land and on April 29, 2006 the doors of the new sanctuary at 4882 Germantown Pike was open. Bishop Samuel Roy Johnson, Sr., was consecrated Bishop in July of 2000 by Inner-Faith International Fellowship Inc. He also walks in the office of a Prophet. His international ministry “Alpha Omega Bethel Churches of India” Bishop Johnson overseer’s twenty-seven church. In addition to the churches, there is an orphanage, widow’s home, a home for the blind and a lepers’ home. Countless healing, miracles and deliverance have taken place under his ministry. Bishop Johnson is a member of the Higher Ground Fellowship under the tutelage of Bishop Dr. Sherman Watkins. He is gifted in the music ministry with over thirty (30) of songwriting, resulting in an outstanding praise and worship ministry. And on November 4, 2008 his first hit was released on Bishop David G. Evans’s cd “Automatic Praise Live” titled “Let Go.” After thirty years of being patient and following God’s lead, Bishop Samuel R. Johnson, Sr., finally fulfill one of his life-long dreams and release Kingdom Keepers on Royalton Records in conjunction with N Season Records and Universal Music Christian Group on Tuesday, February 15, 2011. Elder Wanda L. Johnson became a born again Christian at an early age while residing in Hamilton, Ohio under the leadership of Rev. Jordan at Israel Baptist Church. 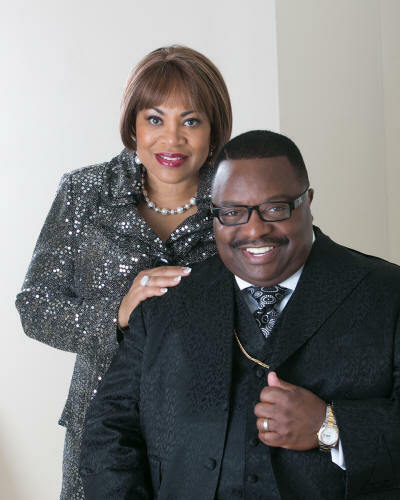 She is happily married to Bishop Samuel Roy Johnson, Sr., Pastor and Founder of Living Water World Ministries, Dayton, Ohio, where she serves as Co-Pastor. This November they will celebrate their 39th wedding anniversary. To this union was born two sons, Samuel Roy Johnson, Jr. and Jason Duane Johnson. Elder Johnson is a graduate of Miami University where she earned a degree in Business Administration. She also attended Sinclair Community College for two years working on a degree in Social Services. Elder Johnson completed her Master of Theology Degree at Dayton Metropolitan College of Theology in June, 2010 and Doctorate of Theology in June, 2011. Elder Johnson had worked as a Social Worker for Butler County Head Start before God so graciously moved her to ministry full time. She is dedicated to serving her church and supports her husband in his vision for Living Water World Ministries. God’s abundant blessings have been manifested in such a way that Living Water World Ministries has acquired 81 acres of land on which the new sanctuary is now built during its first phase of expansion. Out of all the people she has met, the places she has gone she is grateful to God for every opportunity, but her greatest accomplishment is her relationship with God that exceeds anything in her life.